Alexis Sanchez has gotten his Arsenal career off to a fantastic start, and Alex Oxlade-Chamberlain claims he is showing no signs of slowing down, as reported by BT Sport. There have been fears among Arsenal fans that the Chilean would burn himself out after being played in almost all of their games this season. The £32m summer signing is showing no signs of fatigue however, and gave one of his most lively performances to date in the Gunners’ 3-0 win over Premier League rivals Stoke City. Many players struggle to adapt to life in the English top flight, but Sanchez seems perfectly suited to the fast paced and aggressive nature of the Premier League. Arsene Wenger has expressed concerns over the lack of rest the former Barcelona man has had this season, but Arsenal teammate Alex Oxlade-Chamberlain has praised the new signings energy levels, and doesn’t believe he needs to a break. 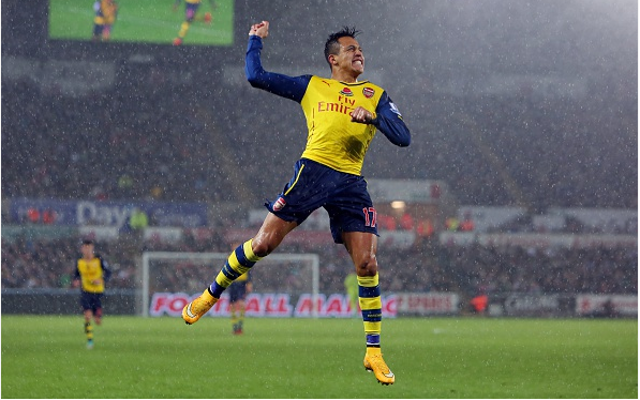 “Alexis absolutely loves it. He is like a Duracell battery – he just does not give in,” the England midfielder said. “Whether it is a cup competition or times when you think maybe it could be a chance for him to come out and rest, he is the first one to say he wants to play and he always wants to be a part of it. “I am sure if the boss wants to rest him, he would respect that as well, but his attitude and the way he approaches training, you wouldn’t think he was tired and the way he is playing, you wouldn’t take him out of the side either.